The place where the Midianites, Kenites and Ishmaelites lived was in the wilderness of Shur. The capital city of Midian was at modern Al- Bad. The Kenites are a sect of Midianites who descended from Jethro the Midianite (Moses father in law) and their traditional territory was near Midian: Judges 1:16. The Midianites and the Ishmaelites intermarried and became one sect that were indistinguishable at the time Joseph was sold into Egyptian slavery in 1893 BC. Gal 4:25 says that Mt. 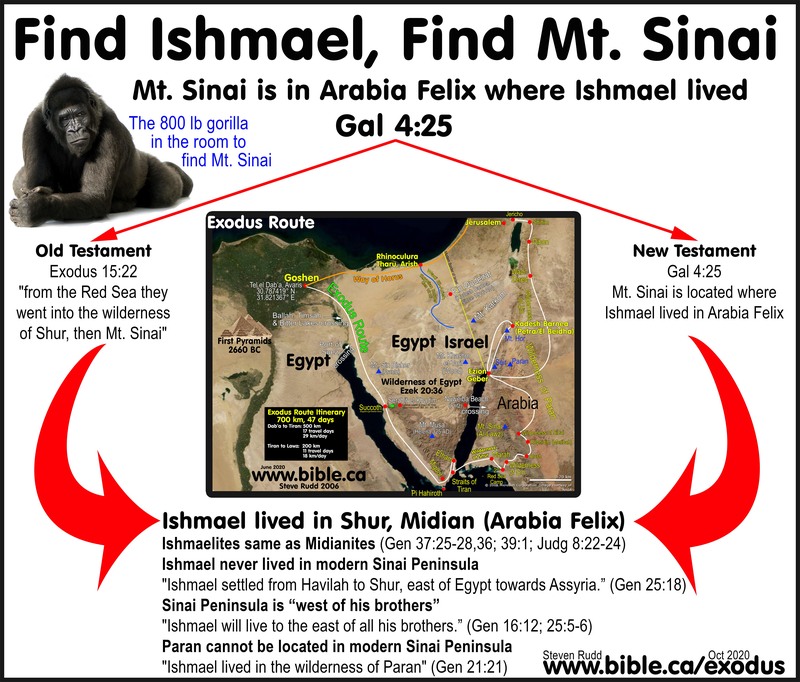 Sinai is in Arabia, where Ishmael lived and Ishmael lived in Shur. The Wilderness of Shur proves Mt. Sinai is in Modern Saudi Arabia. 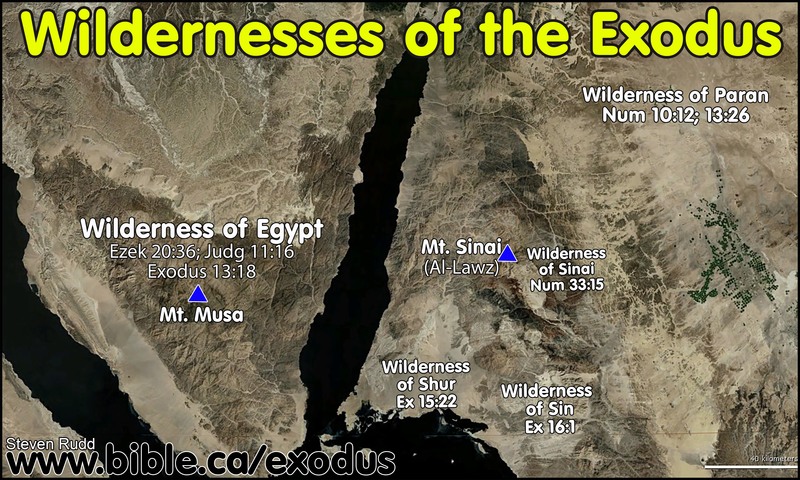 The Wilderness of Shur, is the most important location for determining the exodus route. It is one of only four known places in the list of 50 exodus stops: Goshen/Ramses, wilderness of Shur, Ezion Geber, Mt. Nemo. The Wilderness of Shur is where Ishmael settled and that is transjordan and modern Saudi Arabia. 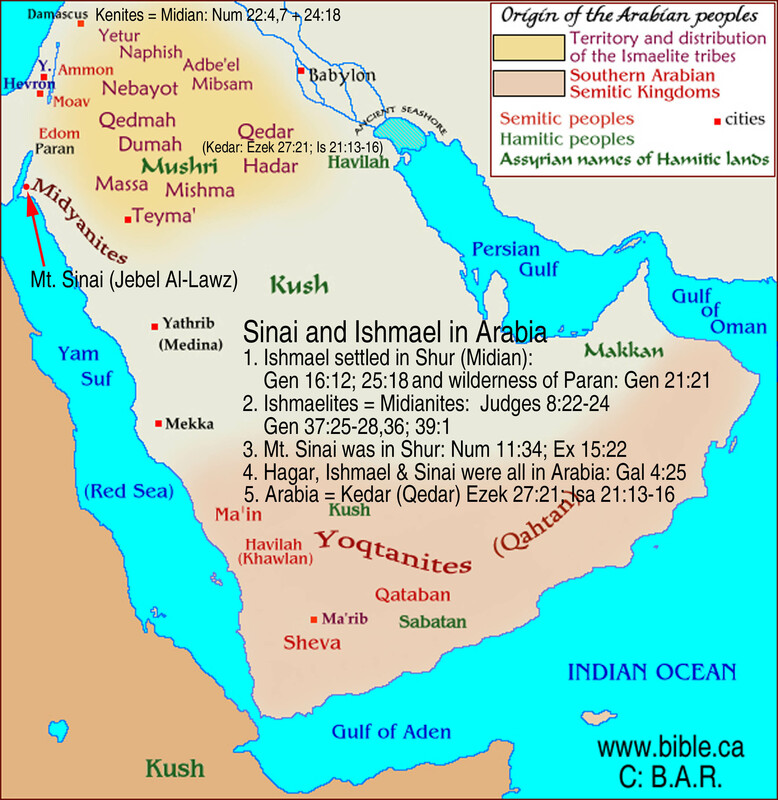 The Bible tells us that Shur is the home turf of Ishmael and we know Ishmael settled near Midian which is in modern Saudi Arabia. We are shocked that more people have not connected this fact. 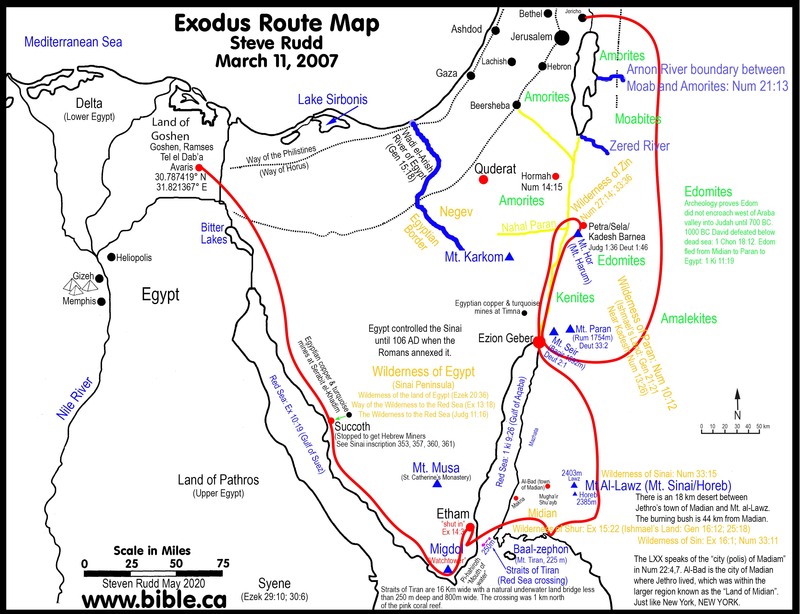 The implications are huge for the exodus route, since it places Mt. Sinai in modern Saudi Arabia. There seems to be a disconnect in the biblical world. On one hand they all know that Ishmael lived in modern Saudi Arabia, yet on the other, they say Mt. Sinai is Mt. Musa in modern Sinai peninsula. Problem is, this is a contradiction. They entered the Wilderness of Shur after crossing the Red Sea and if Shur is where historic domain of the Ishmaelites, and the Ishmaelites live east of the Gulf of Aqaba, then Mt. Sinai must be in Modern Saudi Arabia. Its just that simple. There is an element of circular reasoning that goes on in many exodus route locations. 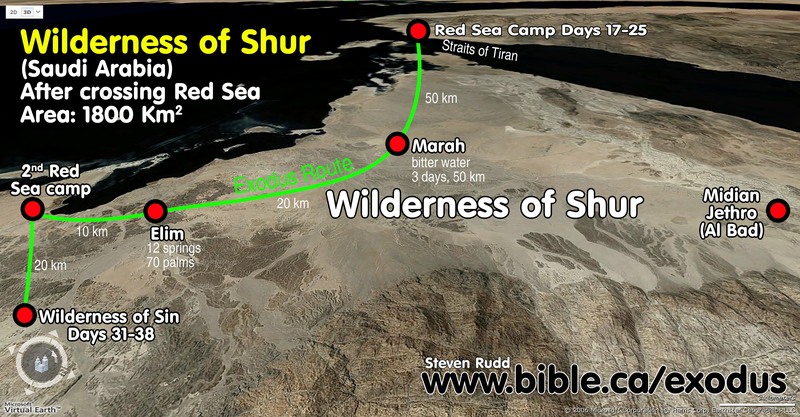 They know the wilderness of Shur is immediately after crossing the Red Sea, so Bible maps place the wilderness of Shur based upon where they think Mt. 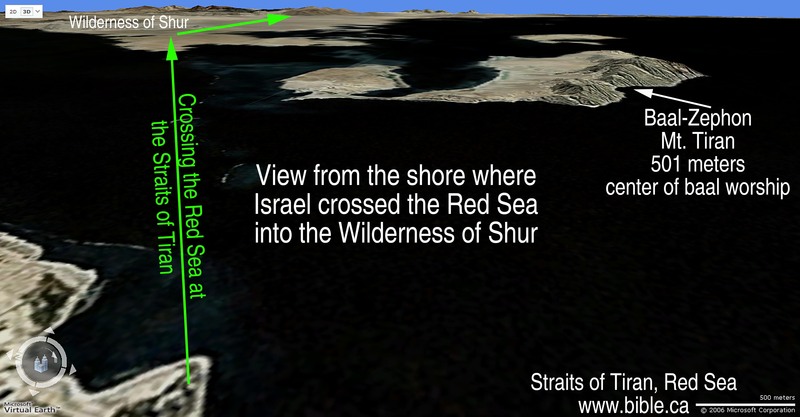 Sinai is, or where they crossed the Red Sea. After Mt. Sinai and the crossing point are chosen, then wilderness of Shur is just plunked into place between them. It is the correct thing to do, except no one knows for certain where Mt. Sinai is or where they crossed the Red Sea. But we do know the wilderness of Shur is the land the Ishmaelites lived in so it should be the priority in placing Mt. Sinai. 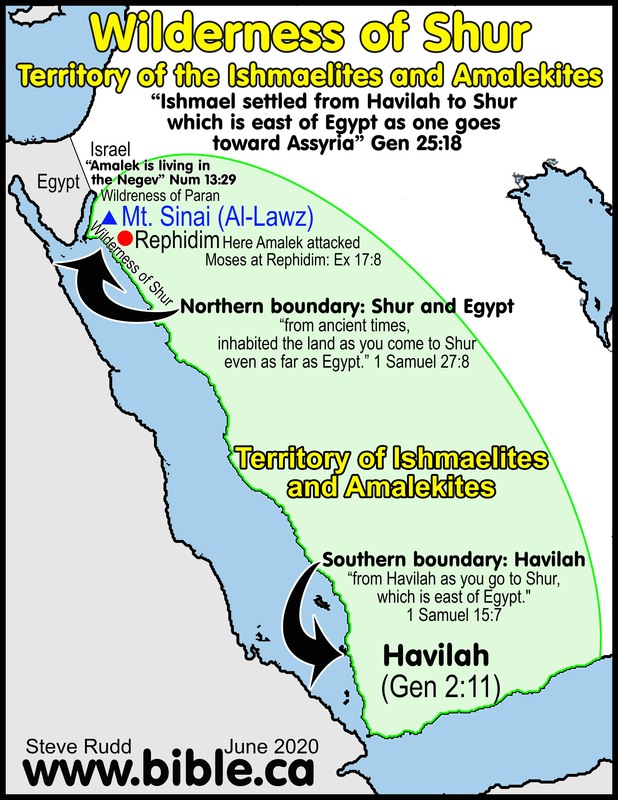 Ishmael settled "east" of the Hebrews in Shur: Shur is traditionally located beside Egypt, but this means Ishmael was West of his brothers, not east. Midianites and the Ishmaelites lived in the same region and are used interchangeable. This proves the traditional location of the Wilderness of Shur wrong. 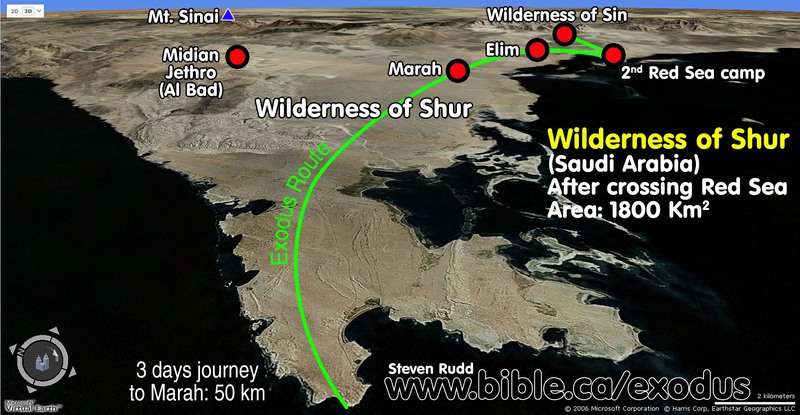 The Wilderness of Shur is located in north Saudi Arabia and biblically immediately after crossing the Red sea. This proves Mt. Sinai is near the land of Midian. 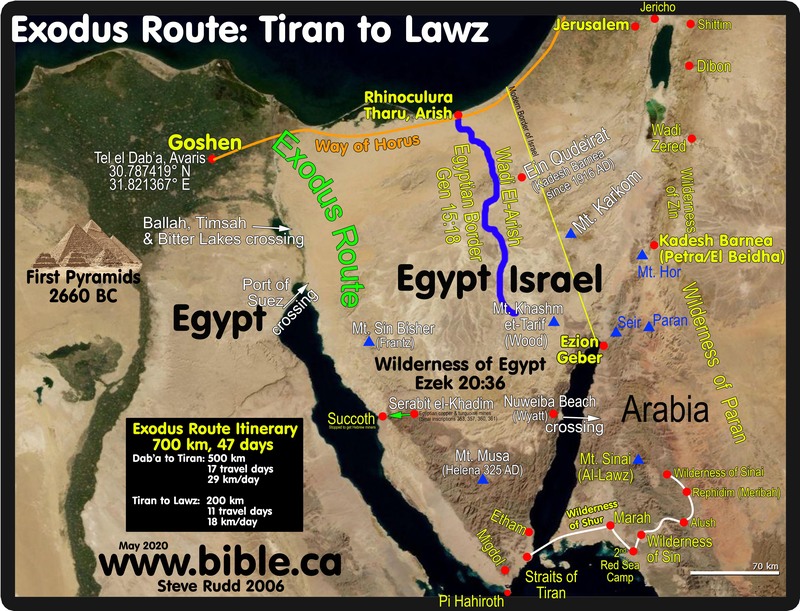 Abraham settled for a time in a transjordan location between Kadesh and Shur. 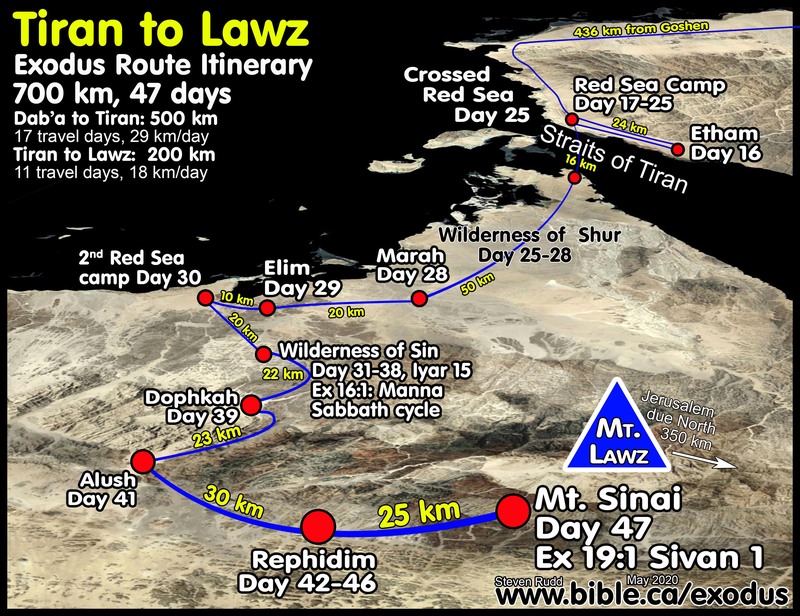 Israel crossed the Red Sea and spent a total of 5 days in the wilderness of Shur before they entered the wilderness of Sin. Three days en route to Marah, then one day at Elim and one day camped by the Red Sea. The Wilderness of a large vast coastal plain of 1800 sq. km. It would facilitate easy travel like the 290 km coastal plain they traveled down the east coast of the Gulf of Suez to get to the Straits of Tiran to cross the Red Sea. They crossed the Red Sea on a Sunday, then spent three days (Mon - Wed) travelling 67 km in the wilderness of Shur until they came to Marah. The wilderness of Etham, found only in Num 33:8, is a gloss not found in the LLX, only the Massoretic text.) The wilderness of Etham is the same, therefore as the Wilderness of Shur. View of the wilderness of Shur from Egypt where they crossed the Red Sea at the Straits of Tiran. Overview of the various wildernesses in the land of Midian. Position of Jethro's home town, Mt. Sinai and the wilderness of Shur. Moses was tending his flocks not far from Midian when he saw the burning bush at Mt. Sinai. Here is Marah and Elim which are both in the wilderness of Shur. Distances are indicated from each stop. Here is an overview map with all the locations between the Red Sea crossing and Mt. Sinai with distances and times. Gal 4:25 says that Mt. Sinai is in Arabia, where Ishmael lived. Detailed outline on the Amalekites. Midianites and Ishmaelites are used interchangeably in the story of selling Joseph to Egypt: Gen 37:25-28,36; 39:1; Judg 8:22-24. Midian was Abraham's son through Keturah Gen 25:2; Ishmael was Abraham's son through Hagar. Although originally different sons of Abraham, the Midianites and Ishmaelites melded into a single group of people from the same region. The two flights Hagar started from the same basic area and ended up at the same place: Flight one from Hebron and flight two from Gerar in the land of Abimelech, king of the Philistines. The flight path heads towards the same "Beer-lahai-rio" spring of water in the wilderness of Paran east of the southern Arabah valley. Twice Hagar fled from Sarah. First in Gen 16 where she ran to a spring of water called "Beer-lahai-rio" that was in the wilderness on the way to Shur between Kadesh and Bered. God told Hagar to return to Sarah and submit to her. The second flight of Hagar is about 13 years later after Isaac was born and Sarah banished Hagar from Gerar in the land of the Philistines. We know that at the time of the Exodus, Edomites were transjordan. Only after the Assyrian and Babylonian captivities 722 - 586 BC, Edom moved into Judah's Territory. Since Kadesh was on the border of Edom, this places Kadesh transjordan. 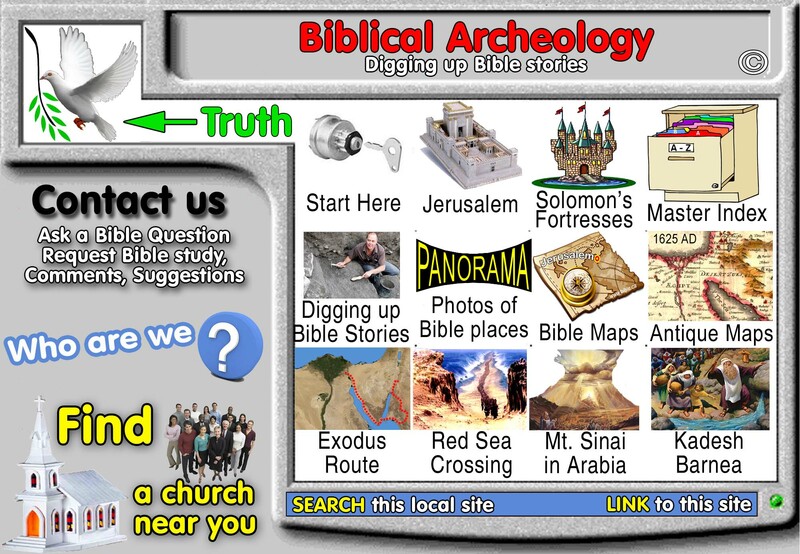 This is where everyone before 1881 AD was looking for Kadesh. Josephus said Kadesh Barnea was at Petra. The first flight from Hebron: Gen 16: Hagar ran straight towards the way to Shur, which starts a Ezion Geber (modern Elat) and goes south down the east side of the Gulf of Aqaba. We don't know for sure where this spring or Bered are located. However, between Kadesh Barnea and the way to Shur give us the general area. Since both Kadesh Barnea and the Wilderness of Shur are transjordan, we can safely place the "Beer-lahai-rio" spring somewhere within the Wilderness of Paran. After Hagar returned to submit to Sarah from Beer-lahai-rio, it seems that Abraham packs up and moves to this very spring of water. "Now Abraham journeyed from there toward the land of the Negev, and settled between Kadesh and Shur; then he sojourned in Gerar. " Genesis 20:1 The text says that Abraham settled between Kadesh Barnea and Shur. This is transjordan and in the same basic area as the Beer-lahai-rio spring. Perhaps Hagar told Abraham about it. Abraham packs up and moves again, this time back to the coast to Gerar where the Philistines where Abimelech was king. Gerar was Abraham's home for "many days". The second flight Gerar: Gen 21: Hagar was wandering in the wilderness south of Beersheba when God opened her eyes to a dug well of water. The Bible then says that "He lived in the wilderness of Paran" Genesis 21:21. What is amazing is that both times, Hagar ran the same basic direction and in both texts, she ended up in the same place: the wilderness of Paran. Probably at the very spring of water she discovered and brought Abraham back to see. She probably returned to the Beer-lahai-rio and raised Ishmael near by in the wilderness of Paran, south of Kadesh Barnea, north of Shur. The Muslims, of course, re-write history and say that the story of Hagar and Ishmael at the well of Gen 21, was not in near Beersheba, but at the Zam Zam well in Mecca. They also re-write history and say that Abraham sacrificed Ishmael on the altar, not Isaac. Allah was originally the pagan moon god named "Hubal". Like Akhenaton, Muhammad chose one god, from among hundreds of pagan gods, to be his one monotheistic god. Both merely repackaged polytheism and called it monotheism. We have identified 12 key similarities between the religious reforms of Akhenaton and Muhammad. Gen 16:2 says, "he will live to the east of all his brothers". This places the territory of Ishmael transjordan and not in the modern Sinai Peninsula. The modern Sinai is west of Israel, not east. 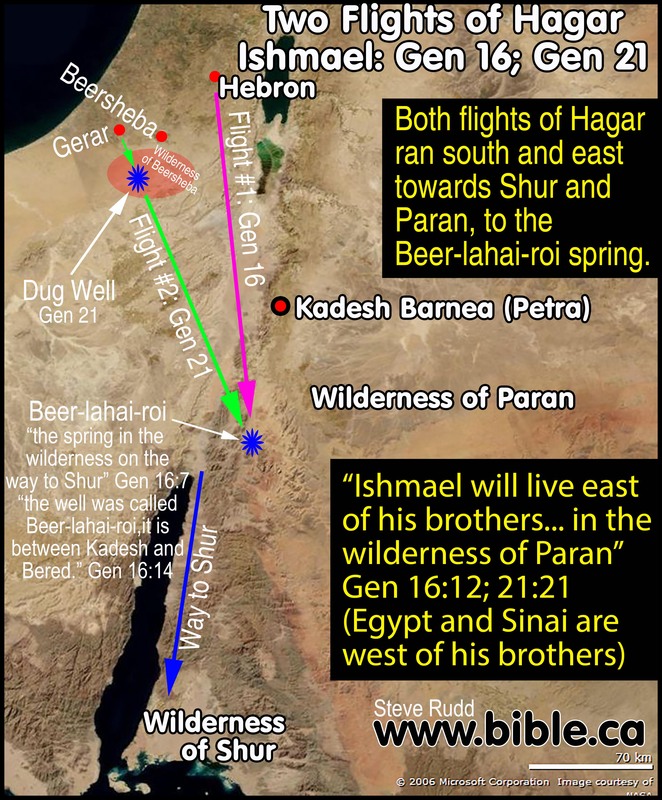 Bible maps currently place the Wilderness of Paran, where Ishmael grew up and lived, within the promised land, east of the wadi el-Arish, the border. This is because Ein el-Qudeirat is where they think mistakenly Kadesh Barnea is located. Since Kadesh Barnea is in the wilderness of Paran, and since Kadesh is also 20 km inside the wadi el-Arish within Judean territory, that makes the wilderness of Paran also inside the land belonging to the tribe of Judah. Overlooking how ridiculous it is to place Kadesh Barnea at Ein el-Qudeirat since this means Israel spent 38 years "in the wilderness", inside the promised land, but they didn't know it, we will now deal with the problem of placing the Ishmaelites within the promised land. The proof that the Ishmaelites lived entirely transjordan, is the fact that during the conquest, the Hebrews never fought or battled them. If the Ishmaelites did live in the territory of Judah, where current maps place the wilderness of Paran, why did Joshua, David or Solomon never run into them? 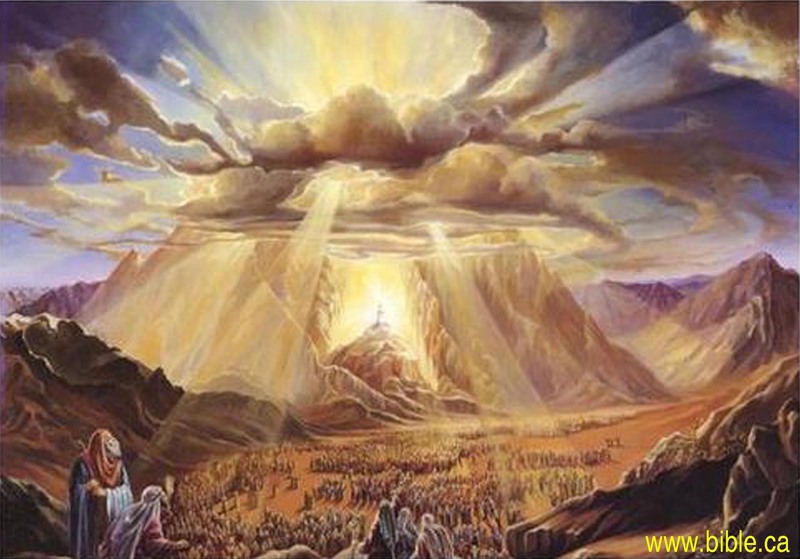 In fact, after entering the promised land, the Ishmaelites are only mentioned four times in the Bible. One of these four times, the Ishmaelites are equated to be the same as Midianites who lived in Modern Saudi Arabia: Judges 8:24. This also shows that the Ishmaelites did not live in the north section of the modern Sinai Peninsula, as would be expected for those who place the Wildernesses of Paran and Shur in that area. Remember that the Ishmaelites became one tribe with the Midianites who lived in the wilderness of Shur at modern Al Bad. Although the Ishmaelites were nomads who roamed wide areas, their home turn has always been associated with a transjordan homeland, east of the Gulf of Aqaba and Dead Sea. Although the Ishmaelites traveled extensively between Babylon and Egypt, there is no evidence that the Ishmaelites would ever consider the modern Sinai Peninsula their land. The Modern Sinai peninsula was always controlled by Egypt in the Old Testament. Excluded Exodus Routes: Nuweiba Beech, Bitter lakes, Gulf of Suez, Mt. Musa, Mt. Karkom, Ein el-Qudeirat. The traditional location on most Bible maps for the Wilderness of Shur is due east of the modern Suez Canal. Traditional location on most Bible maps for the wilderness of Paran is west of Beersheba and Ein el-Qudeirat. Problem is, these two areas have never been considered home turf for the Ishmaelites. The fact they were nomads doesn't change the fact that their traditional territory has always been transjordan. The wilderness of Paran is located beside Ein el-Qudeirat (current choice for Kadesh Barnea), yet both are within the promised land. This means that when Israel thought they spent 38 years in the wilderness, they were actually in the promised land all along. Since the wilderness of Paran is where the Ishmaelites called their homeland, we should find some conflict with them during the conquest, but we don't. Of course the entire modern Sinai Peninsula is part of Egypt and under Egyptian control. The eastern border of Egypt is the wadi El-Arish. Ishmaelites would certainly not attempt to claim this as a home land. This same wadi El-Arish (river of Egypt) was also the historic border of the promised land between Egypt and Israel: Gen 15:18. We have definitively proven that Mt. Sinai is in modern Saudi Arabia by associating the Wilderness of Shur with the homeland of the Ishmaelites. We have the witness of the Old Testament that the Ishmaelites lived in the land of the Midianites, in modern Saudi Arabia, since the two tribes are used interchangeably in several different texts. The two flights of Hagar (Gen 16; Gen 21) headed towards modern Saudi Arabia. Both times Hagar ran towards the land where she would raise Ishmael. Find the place of Hagar and Ishmael and you have located Mt. Sinai: Gal 4:25. We have the witness of the New Testament in Gal 4:25 flat out stating that Mt. Sinai is in Arabia... where the Ishmaelites lived.